Sorry about the glare. It says, "Big Flavor! Easy Preparation! 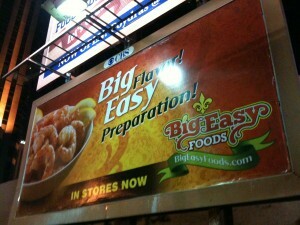 Big Easy Foods"
So, this ad has two occurrences of Shift of Meaning. First, “big” means “lots of” flavor and “easy” means “not difficult” to prepare. However, the name “Big Easy” refers to New Orleans which is a “large” city where the attitude is “relaxed and easy going”.